In this module you will learn how to use the Dynamic Tooltip Custom Visual by MAQ Software. The Dynamic Tooltip allows you to add extra insight to your report or visuals with a popup that provides additional information. Adds additional insight to existing visuals or reports. can display measures and/or text. Tooltip image can be changed to something else. 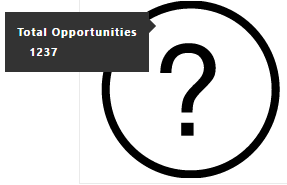 This Dynamic Tooltip shows to total sales opportunities for the data set when the user puts their mouse over it. Under the Format paintbrush there are a few settings that you can configure to adjust the tooltip appearance. 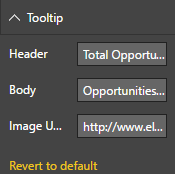 Under the Tooltip setting you can change the Header, Body, and Image URL used to display on the tooltip. The Measure Tooltip property allows change the tooltip from simply displaying text you type to displaying a measure value. The formatting of that measure can also be adjusted here.